IMAGE: The now deleted tweet from @DCCTraffic. Dublin City Council apologised yesterday for an outburst on its @DCCTraffic Twitter account in reply complaints from cycling campaigners about the city’s policy of directing buses and coaches to park on cycle tracks. I Bike Dublin was complaining about the council agreeing to a large number of buses to stop at the front of Custom House when there isn’t enough space; coach parking on the footpath and cycle path outside the 3 Arena; and the council sanctioning coach parking on the S2S cycle path on the Alfie Byrne Road for U2, Coldplay, Bruce Springsteen and other events held in Croke Park. I Bike Dublin tweeted: “@DCCTraffic we need to talk. NTA and Gardai are pointing fingers at you on cycling safety issues we have raise with them”. 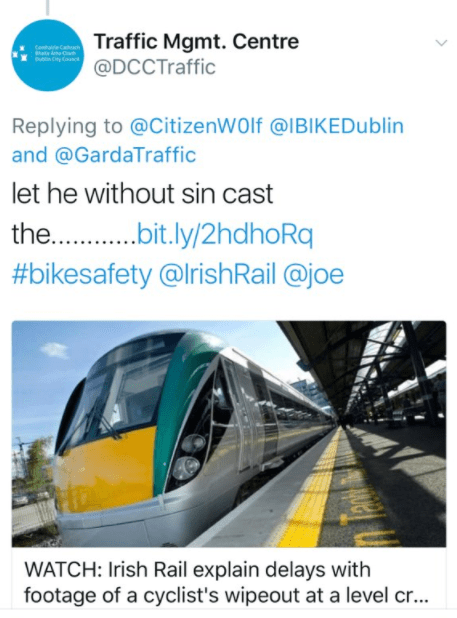 An official in the council’s transport department replied to cycling campaigners’ safety concerns by tweeting “let he without sin cast the…………” and linking to a video of a cyclist hitting a railway barrier. Ciaran Cannon, the junior minister for the diaspora and international development, said that the tweet was an “Utterly shameful message emanating from a state sponsored body charged with traffic management and road user safety in Dublin city.” Cannon cycles in Dublin and is a supporter of cycling safety incentives. Shall we divulge the secret place, where all cyclists meet everyday and decide to behave exactly the same..? Speaking to IrishCycle.com, a spokesperson for I Bike Dublin said that it was still seeking a meeting with the council. Dublin City Council did not respond to a request for comment. Well, maybe some good is coming from this after all. The rallies held by iBike Dublin are being notified. Such actions can take time to gain traction, but similar to the kindermord rallies in the Netherlands, it can have big long-term benefits. Talking is part of the solution, but only a part. Actions and demonstrations (and blogs that raise awareness such as this one) also have a big role to play in making societal changes. Ah shure what harm are the buses doing anyway and who cares about bikes anyway and didn’t we only paint those lanes red so we could tell the EU how great we are.